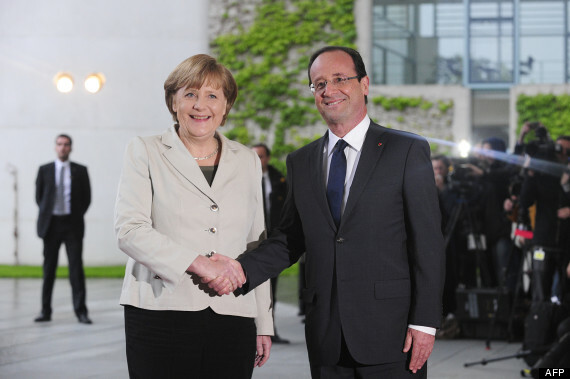 Open Europe: 'Communication problems' between Angela and François? As said earlier Greece simply looks a 50/50 (or something in that direction). It simply imho looks more likely to be dropped. (With Merkel being the uncertain factor, as she is a bit of a coward, really). The reason for that is basically although that everybody knows that the Troika report will be horrible everybody is waiting for it. (As there is hardly any important variable that will be positive and a lot will clearly be negative, the outcome donot need Nobelprice style maths to be calculated as overall pretty negative). 2. Why wait till the report? Simply makes no sense. If you want to solve it do it before Spain really hits in with Italy following it. 3. Simply looks like everybody wants somebody else to pull the plug out. Most likely candidate the IMF. The IMF can obo of earlier demands simply not accept this. So subsequently basically will not pay for this term. Although the IMF has recently become more and more political (not a good thing imho). 4. There the whole thing would start. This would require a Greece 3.0 rescue and that is very unlikely to happen as it would require a new round of parliamentary approvals. Which means that Merkel keeps relatively clean hands in Europe. 5. Anyway if Greece doesnot go this time it will go the next or the one after that. Full rescue totally unlikely as that would give the South a license to do with spending what they want. Greece meeting the targets even more unlikely. Anway if the IMF wants to remain credible it will have to pull the plug out probably this year or otherwise next. Fully agree with CiTi Greek exit 90% certain, within the next 12-18 months. 6. Probably a default in the EZ would have been better but looks simply too late to organise properly. So we likely see the combination default plus exit. 7. Anyway a Greek default would open another can of worms. The official debtholders will get a haircut and likely in several countries that will ahve budgettary consequences. As the haircut is for bookkeeping purposes the moment the loss is made. Requiring new capital in ECB and/or national CBs and possibly curts in normal spending to compensate the losses. Will make the EU and Euro really popular. @Rik - Yesterday and today, lots of words about the technicalities of the EU in relation to the Greece crisis but would also apply elsewhere. It is no wonder that voters are becoming more and more frustrated with the inability or unwillingness of the EU to settle these problems. The perception is that the whole Euro currency was mainly a way to make German goods acceptably cheap and that the PIIGS and Cyprus are paying the price for that. Surely simple humanity says these people should be allowed to return to their previous currencies absorb the devaluation and other consequences and get on with their lives.